Raoul: [to Sarah] Don't you look at me. Burnham: Hey, all I know about this is what I've seen on TV. You gotta talk me through this. Burnham: Nice house you guys got. Mom's rich? Sarah: Dad's rich. Mom's just mad. Burnham: I wish I could put my kid in a place like this. Not that I didn't try. Just sometimes things they don't work out the way you want them to. Wasn't supposed to be like this. You weren't supposed to be here. Q: What is a panic room? Q: What are bearer bonds? 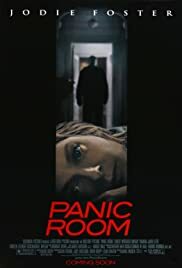 Although "Panic Room" is probably meant to be a thriller or suspense film or something like that, I couldn't help but think it was a comedy. The zany robbers, the lonely house, and the little "girl", who really really really really looks like a boy. From this description, "Panic Room" has all the right ingredients for a "Home Alone" style laugh-fest. The little girl even looks remarkably like Macualy Culkin. However, after only a short way into the film, my hopes and dreams were shattered mercifully by the director. 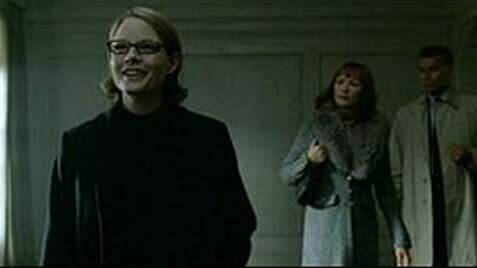 On viewing "Panic Room", no humorous brick-throwing-at-robbers-heads did I witness; no side-splitting falling-down-stair action; no comical electrocutions; and no grievous-bodily-harm inflicted on the devious home-invaders from the spirited young under-dog. Instead, the film subjects the viewer to one of the most painful experiences of their lifetime. The movie drags and drags, never actually achieving anything of great importance. Every supposed "twist" and "turn" can be easily predicted with the tiniest amount of foresight, and you couldn't give a crap as to whether any of the characters live or die. However, the most irritating problem with the movie is probably the ludicrous plot, which makes you scream and yell at the TV(or movie) screen at the incredibly dumb characters. It seems that when criminals invade your house and you are locked in the very room they are trying to get into, your brain only works at half-capacity. This can also be said about the people who made this film. The dim-witted characters are annoying-as-hell, but what can be expected from a movie that centers around just one room in a house. "Phone Booth" had the right idea with the "one-scene-only" style story, but "Panic Room" doesn't. After viewing it, you wish that Macualy Culkin was around, and he was setting your scalp on fire, knocking you down stairs with paint cans, or hurling bricks at your head from the top of a 3-storey building. Any or all of these would cause less pain than sitting through the krud-tastic lame-fest that is "Panic Room". In the end, why couldn't have Jodie Foster and Boy-girl just have gotten a house with a 'Panic Gun'. It would have made a lot more sense, and made the movie a lot shorter- which would have been a good thing. Damn you "Panic Room". Damn you for wasting my time; and damn you for getting me so fired up that I'm wasting my time writing this review. 31 of 64 people found this review helpful. Was this review helpful to you?